Members of the 2nd Pennsylvania Regiment and the 43rd Regiment of Foot seen in action in 2012 at Germantown. 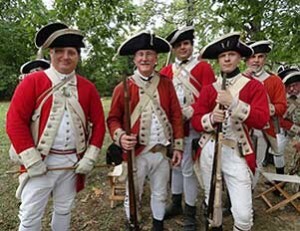 The reenactors hope to reenact the Battle of the Brandywine in at Sandy Hollow in Birmingham in 2014. BIRMINGHAM — The British are coming! It appears the township will be welcoming them this time, as the reenactment at Sandy Hollow planned for next spring took another step forward at the last township meeting on April 1. 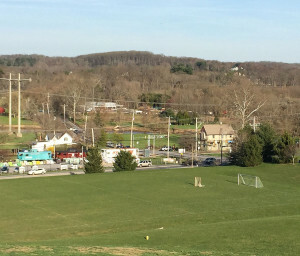 Representatives from the Recreation, Parks and Open Space Committee (RPOS), and guest Paul Loane, a re-enactor from the 2nd Pennsylvania Regiment and the 43rd Regiment of Foot, responded to the concerns raised by the supervisors last month, namely parking logistics and volunteer support. Loane visited the site with members of the RPOS and determined there would be plenty of room for parking. He also noted that the revolutionary weapons will be discharged far from the residential neighborhoods and would present minimal disturbance. The committee also informed the supervisors that Linda Kaat has volunteered her efforts toward the project, and they are very confident in her experience and enthusiasm. Supervisor John Conklin asked, “Is it possible to have the Americans win this time?” Mr. Loane informed the group that typically the plan is to have two days of battle re-enactments, with the British winning on the first day, and the revolutionaries winning on the second. He added that the re-enactment will be “a wonderful way to draw attention to that site” and the grand history of the township. In related news, Conklin announced that the interpretive sign has been installed at Birmingham Hill, and is a welcome addition to the park. He complemented the RPOS committee on their hard work. Roadmaster David Rathbun reported that less than anticipated snowfall has resulted in budget savings. Conklin commented that this savings helps to make up for over spending a few years ago. 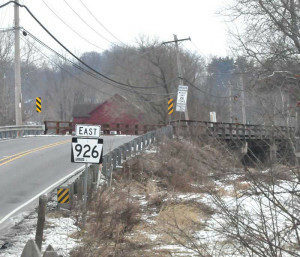 Typically the township evens out with snow plowing and sand expenditures over a five-year period. Kathleen Kennedy has been appointed to the Historic Architecture Review Board to fulfill a vacated term ending this year. The township has enlisted the services of an attorney, Joe Rudolph, for advice regarding the potential formation of the police force into a bargaining unit. This step was taken to protect the rights of the residents. The primary concern is safety of any group that would be involved in a clean up effort. No decisions were made, but several suggestions were presented. Finally, Conklin recognized several significant anniversaries of township employees: Police Chief Tom Nelling – 25 years (20 years as chief); Quina Nelling, Treasurer and Secretary – 25 years; Gail Ayers, Office Assistant – 15 years, and Patrolman John Freas – 15 years. Supervisor Kirkpatrick added that they are recognized for their “institutional knowledge,” and the township is lucky to have these employees.